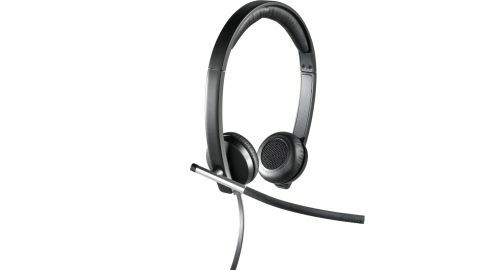 The Logitech USB Headset Stereo H650e is another business-orientated headset from Logitech. In many ways it is very similar to the Logitech Wireless Headset Dual H820e, with an almost identical design that is simple, yet also good looking and professional. It has the same faux-leather ear cups and head rest that look nice and ensure that the headset is comfortable to wear for long periods of time. As with the Logitech Wireless Headset Dual H820e, the microphone's boom arm is adjustable, so you can place it in the 'up' position when you're not using it. The H650e comes as a stereo headset with two ear pieces, which do a good job of cancelling out surrounding noise, so you can concentrate on your call. Where the H650e is different to the H820e is that it is not wireless, instead coming with a USB cable. The cable is long enough to connect to your computer and not have you awkwardly leaning over the keyboard, though it's still a far cry from the freedom offered by the wireless H820e. An in-line remote allows you to control the volume and mute the headset, as well as take calls (though this feature doesn't work with all software), but we had no problem getting it to work with Microsoft Lync. The controls on the cable mean that there are none on the headset itself, and the in-line remote is one of the more bulky remotes we've seen, but for professional use this is not a problem. The H650e comes with a nice carry pouch and is a fair bit cheaper than the H820e. Of course, the most important thing about a headset for business use is the audio and recording quality. Thankfully, the H650e does not disappoint, with clear and accurate sound reproduction from the speakers, along with excellent noise and echo cancellation, courtesy of the microphone. The Logitech USB Headset Stereo H650e is a very good business headset, with excellent audio and recording quality. It has a decent design and is comfortable to wear, and the price is about right for the features you get. At a push we prefer the wireless H820e, which gives you more freedom when on a call, but it does come with a higher price tag. If you want an affordable headset with excellent sound quality, though, the Logitech USB Headset Stereo H650e is a fantastic choice.